It’s that time of the year again, where kids are about to start school and moms are in need to have quick breakfast food on hand. Summer is almost over and so are long and leisurely breakfasts. 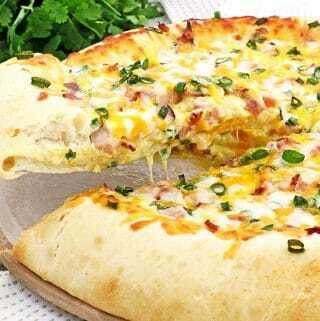 It is time to think about breakfast hacks again. Zucchini is overflowing our stockpile but they do get missed in later months, so this is a good time to put them to good use and enjoy them. … or too many for the size of your family? They are freezer friendly. 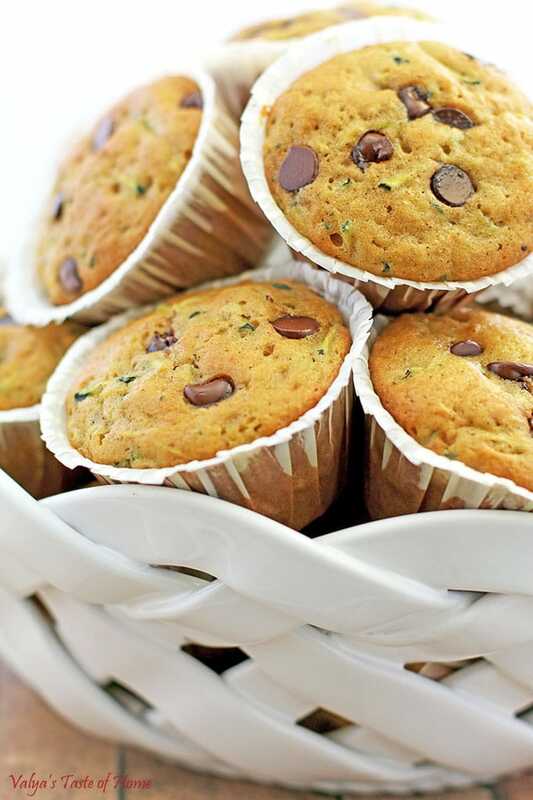 These delicious muffins are great for busy parents, perfect for breakfast at home or to pack for school lunch boxes. 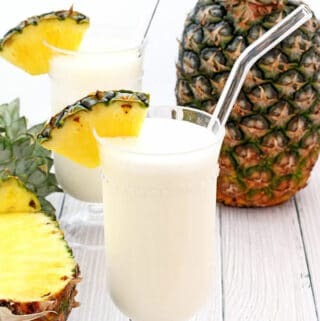 When kids are in school, it’s a great time to do things that are much tougher in the summer months. After dropping off the kids, many days you feel like launching into your schedule as soon as you’re back home. On the days when making a full, drawn out breakfast cuts into your go-time, having these little gems around is great! The incredible Greek Yogurt and butter makes them super soft, and moist. They are loaded with zucchinis and don’t even taste like it; a good way to begin pushing thinking, memory and focus food, like vegetables, into kids’ diet. Especially the picky ones. My kids love them very much. Who wouldn’t love a serving of this sweetness? Tall or small. Enjoy! 1. Grate zucchinis set aside until ready for use. 2. 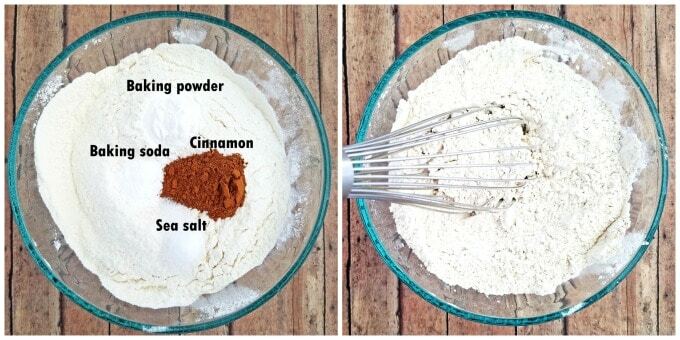 Sift flour and combine all dry ingredients: baking soda, baking powder, sea salt, and cinnamon. Set aside until ready for use. 3. 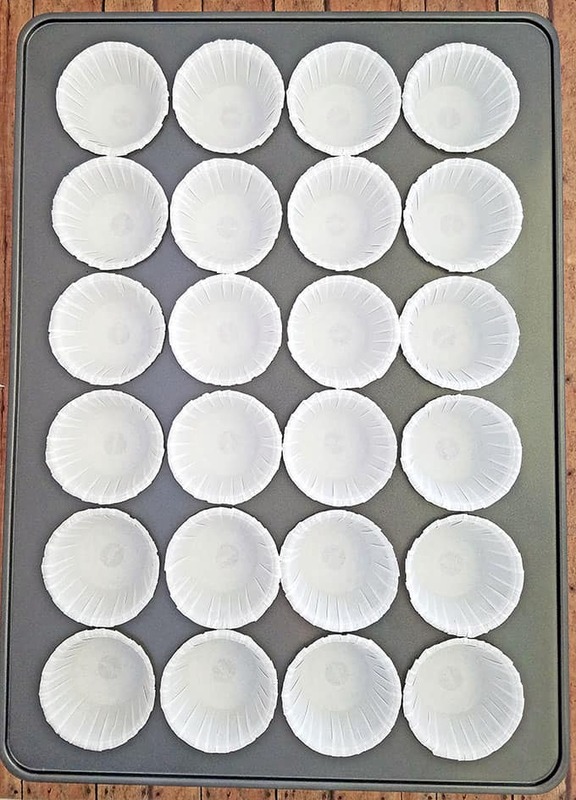 Line a muffin pan with paper cupcake liners and set aside until ready for use. 4. Preheat oven to 350 F (180 C). Beat eggs, brown sugar, and organic sugar on high for 5 minutes. Reduce speed to low and add vanilla, melted and cooled butter and Greek Yogurt. Mix for a minute or 2 until all incorporated. 5. 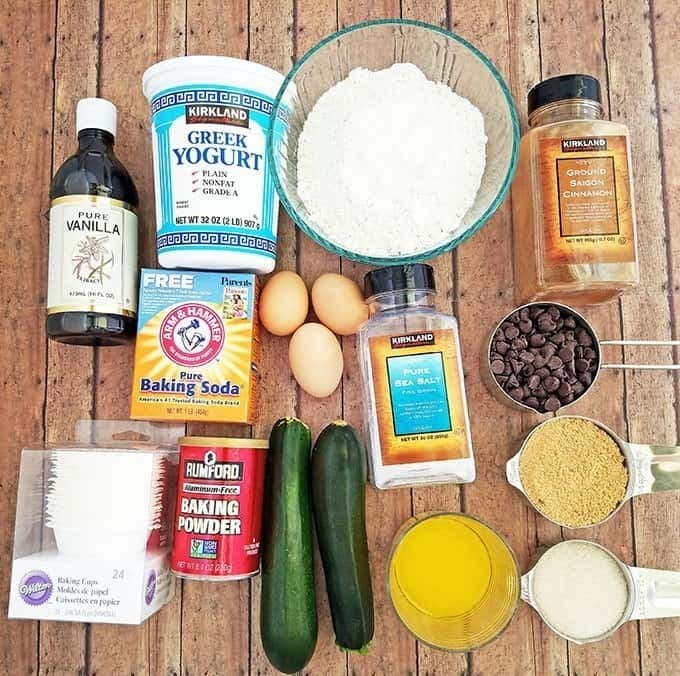 Add dry ingredients by alternating half flour and half of grated zucchinis. Scrape down the sides of the bowl with a silicone spatula, add 3/4 cup of chocolate chips and mix for a minute until combined. 6. 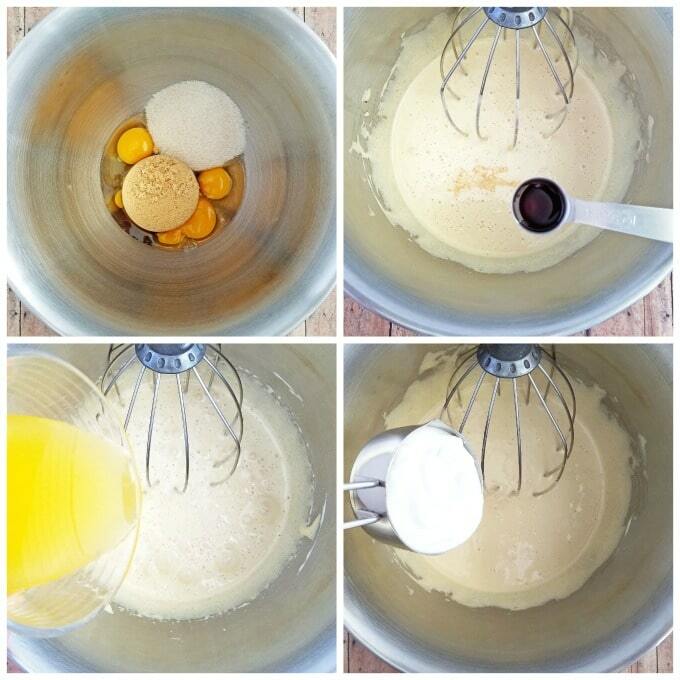 Remove mixer bowl from stand and mix batter once more with a silicone spatula to ensure all the ingredients are well combined. Scoop batter using a large ice cream scoop, and fill prepared muffin liners 2/3 full. 7. Bake muffins for 20 – 25 minutes at 350 F (180 C). 7. 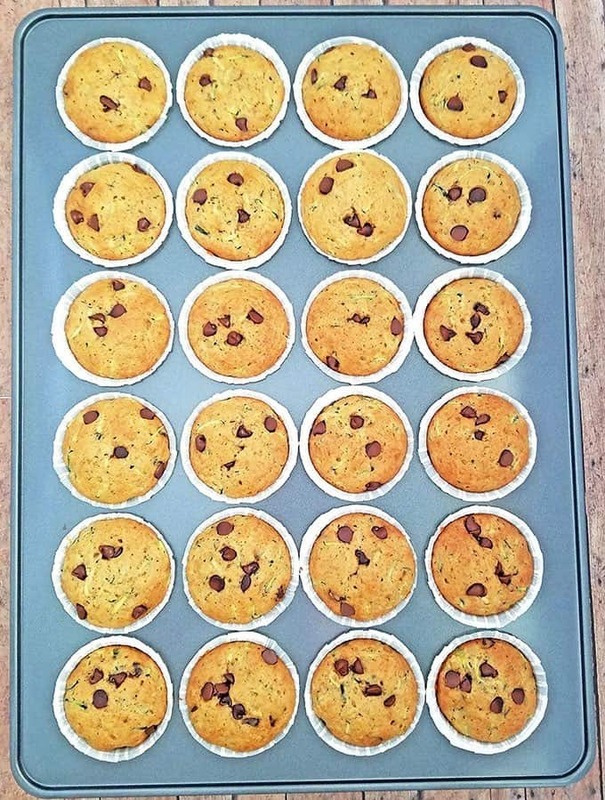 Remove from the oven and let the muffins cool for 5 minutes before removing from the muffin pan. 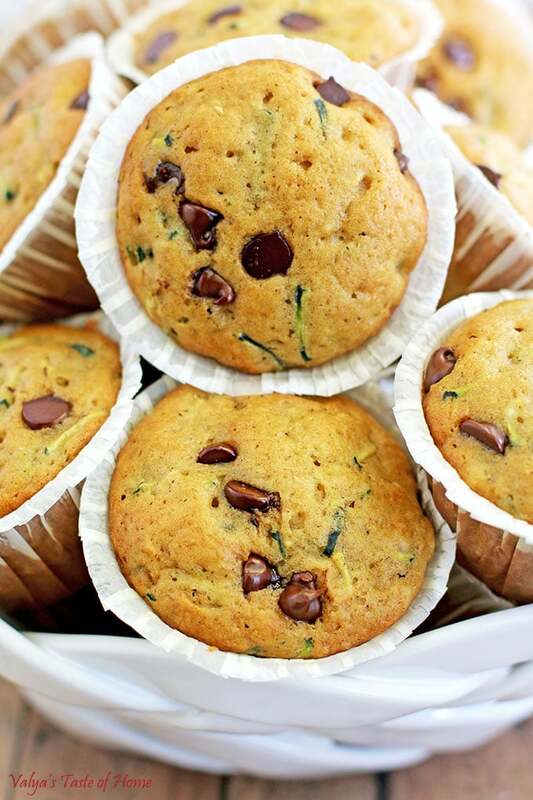 After the muffins cool completely, store them in a plastic container or freeze in freezer Ziplock bags. The incredible Greek Yogurt and butter makes them super soft, and moist. They are loaded with zucchinis and don't even taste like it; a good way to begin pushing thinking, memory and focus food, like vegetables, into kids’ diet. Especially the picky ones. My kids love them very much. Who wouldn't love one a serving of this sweetness? Grate zucchinis set aside until ready for use. Sift flour and combine all dry ingredients: baking soda, baking powder, sea salt, and cinnamon. Set aside until ready for use. 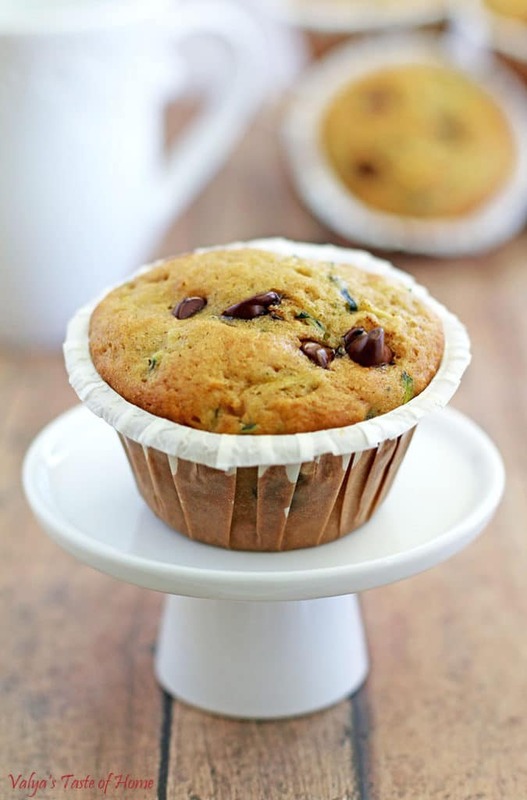 Line a muffin pan with paper cupcake liners and set aside until ready for use. Preheat oven to 350 F (180 C). Beat eggs, brown sugar, and organic sugar. Beat on high for 5 minutes. Reduce speed to low and add vanilla, melted and cooled butter and Greek Yogurt. Mix for a minute or 2 until all incorporated. 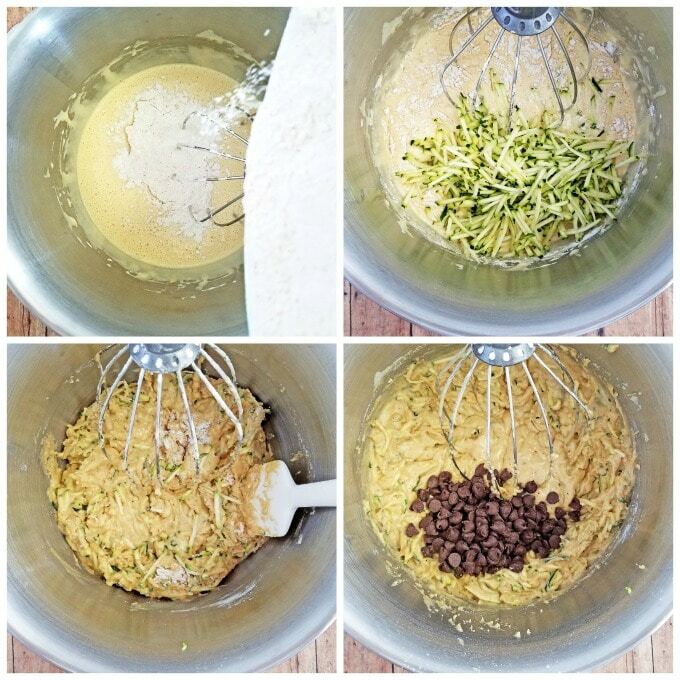 Add dry ingredients by alternating half flour and half of grated zucchinis. Scrape down the sides of the bowl with a silicone spatula, add 3/4 cup of chocolate chips and mix for a minute until combined. Remove mixer bowl from stand and mix batter once more with a silicone spatula to ensure all the ingredients are well combined. Scoop batter using a large ice cream scoop, and fill prepared muffin liners 2/3 full. Bake muffins for 20 - 25 minutes at 350 F (180 C). 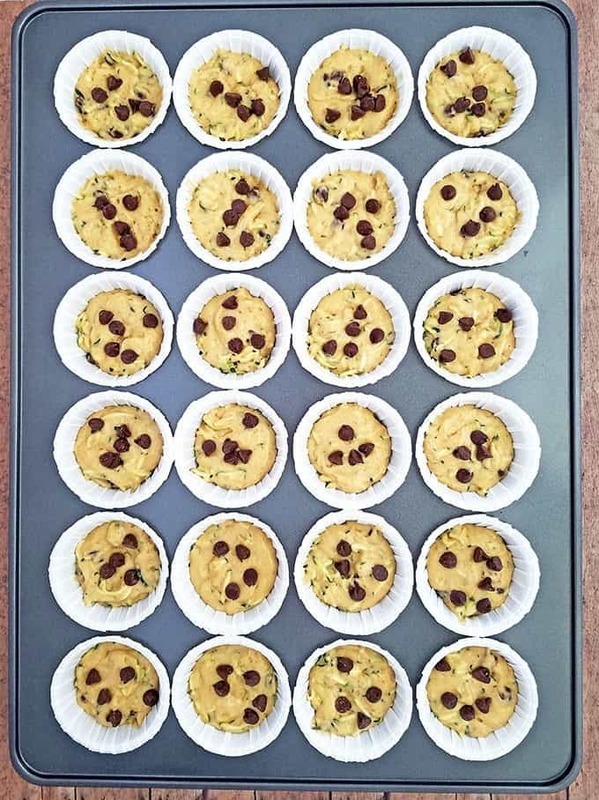 Remove from the oven and let the muffins cool for 5 minutes before removing from the muffin pan. 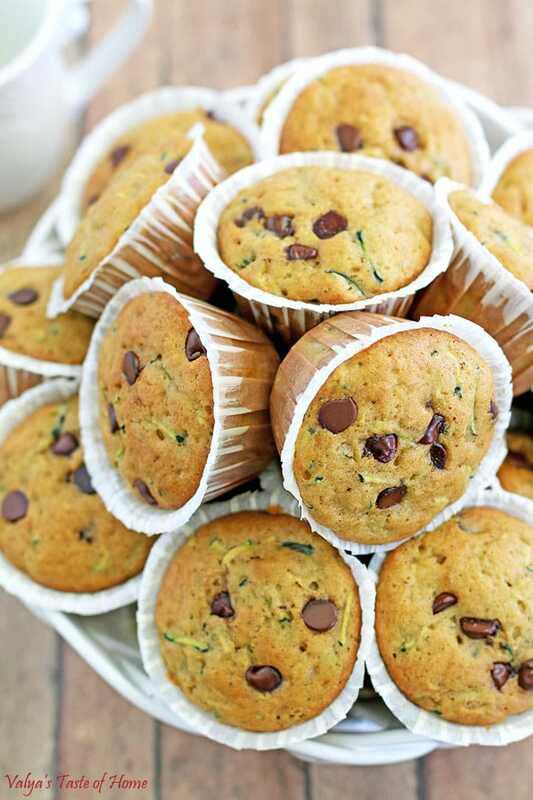 After the muffins cool completely, store them in a plastic container or freeze in freezer Ziplock bags. 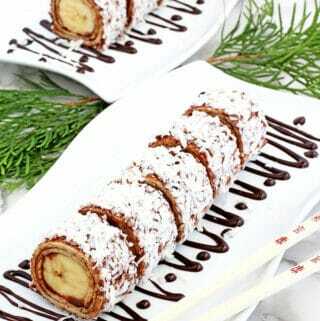 Enjoy with a cup of hot tea or coffee or a cold glass of milk. 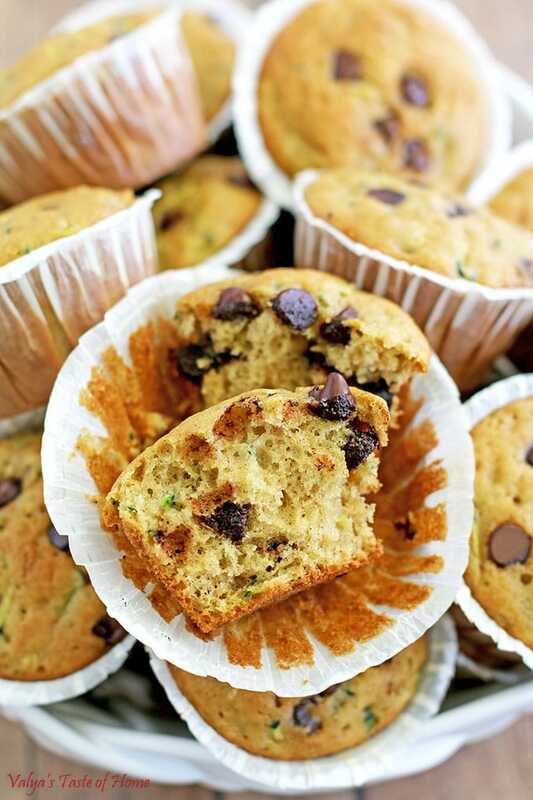 If you make this Zucchini Chocolate Chip Muffins Recipe please share a picture with me on Snapchat, Facebook, Instagram or Pinterest. Tag with #valyastasteofhome. I’d love to see your creations! ? 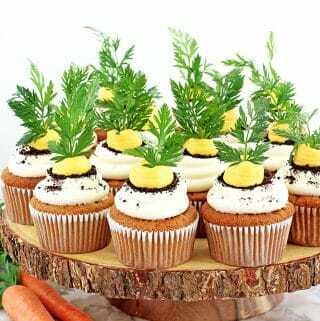 These muffins look to beautiful to eat. 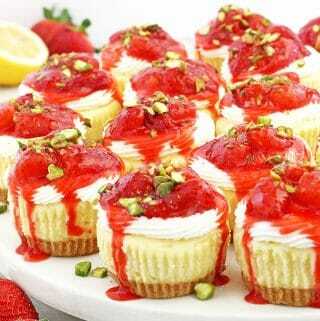 I’ll be making them soon. I’ve made them and it’s a keeper ? !!! Love how moist and soft they are, with just ? amount of flavor. I’ll be making it again and again. Thank you so much for the recipe! Can i make these without zucchini ? 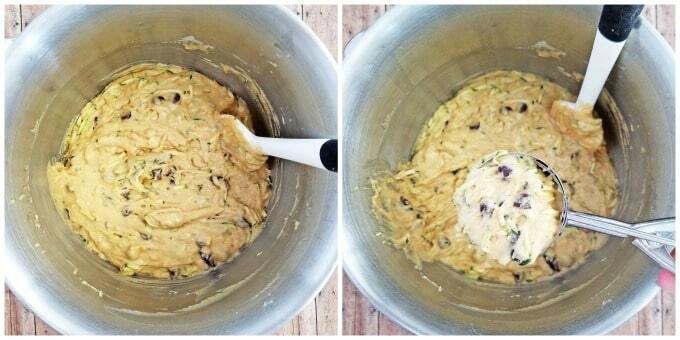 It’s possible, but you will need to reduce the amount of flour in the batter. 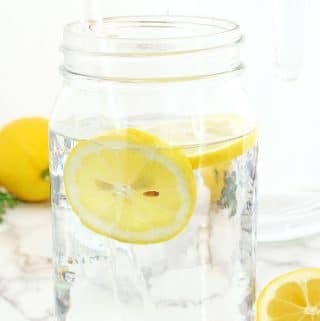 I would start adding from 1.5 cups to 2 cups. Let me know how it turns out for you. Do you every squeeze the zucchini in a cheese cloth to get excess juice out? Or do you just shred it and put in with all the juice? Hi Natalya. It depends what shredded you use. 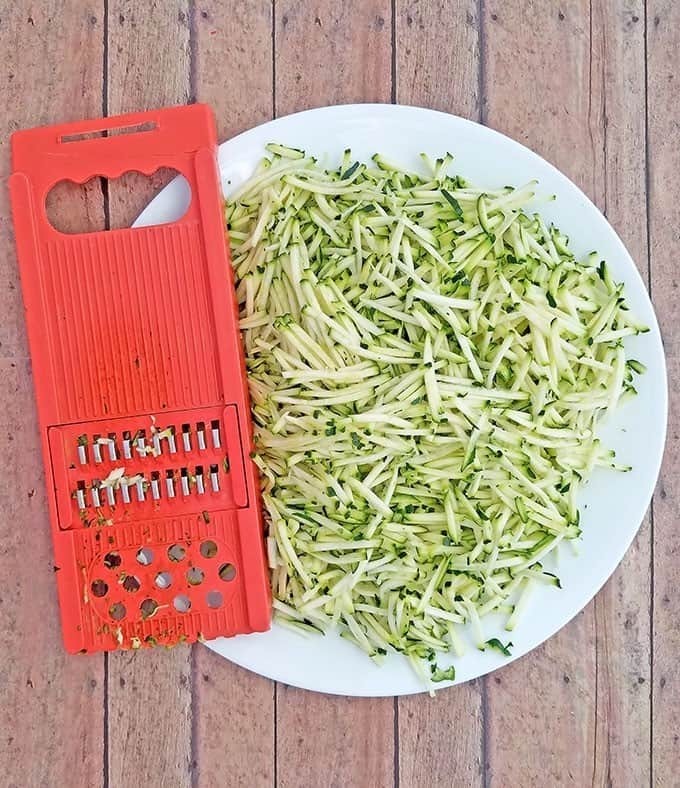 If you are going to shred zucchinis with carrot sredder (like the one I used for this recipe) then you don’t need to squeeze the juice out of the shredded zucchinis. But if you’re using regular grater to shred zucchinis then they will have a lot of juice and it’s best to squeeze some out otherwise the muffins will be wet and gooey. I hope this clarifies more. That’s a great question, thank you for asking. I did use regular granulated sugar but reduced the total amount of sugar. I did squeeze out the water from the shredded zucchini and added One ripe organic banana. I love this recipe with baby chocolate chips! Thank you. I will be making again!